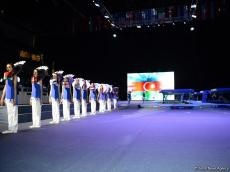 A solemn opening ceremony of the European Championships in Trampoline, Double Mini-Trampoline and Tumbling took place in Baku on April 12. This time, the audience witnessed a real show in American style at the opening ceremony. Along with the traditional gymnastics tools, spectators could see a basketball ring on the stage. Basketball originated in the US was created just to diversify gymnastics classes. It is no coincidence that the creation and development of the trampoline gymnastics also occurred in the US. The historical ties of two completely different kinds of sports became the main theme of the opening ceremony. Another innovation of the opening ceremony was that along with the national teams in various gymnastic disciplines, members of the technical committee for trampoline gymnastics also took part in the show. The most interesting character of the European Championships was mascot 'Gur-Gur', a fuzzy, green frog. To bring Gur-Gur to life, the AGF has enlisted the services of long-time American mascot professionals, Scott Hesington and Barry Anderson. They came to Baku to demonstrate an unforgettable show for the audience during the four days.